This page stopped being updated around 2008, but remains here out of historical interest. I had previously studied some electronics, but it was generally taught from a purely theoretical point of view, which I found fairly incomprehensible and irrelevant. I lost interest until attending a "circuit bending" workshop a good while later. Definition from Wikipedia: "Circuit bending is the creative customization of the circuits within electronic devices such as low voltage, battery-powered guitar effects, children's toys and small digital synthesizers to create new musical or visual instruments and sound generators." This was electronics taught from a totally different angle, where experimentation and exploration were encouraged, and there was no "wrong" way of doing anything. 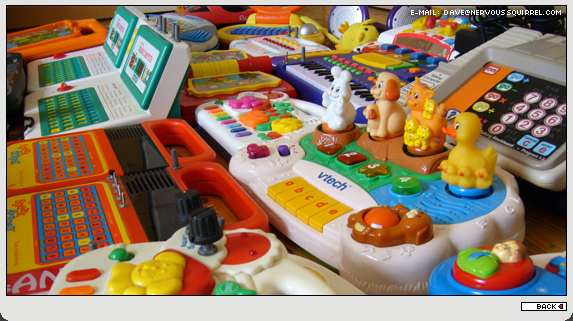 Also, being interested in electronic music and synthesisers helped, as that provided an interesting goal of trying to make the strangest noises possible out of cheap children's toys. It's interesting that circuit bending seems to be a skill that is actually lost as more experience is gained. After a few years of experimenting and gradually learning more about electronics, I find that there are mental blocks now in place that restrict the same kind of uninhibited exploration that occurred in the early days. Whereas initially any connection was equally valid, I would approach the same project now and think "Better not connect to that part, as it might get damaged...". I suppose it's the same as losing your child-like imagination as you get older and make more connections in your brain that tell you a cardboard box is not a spaceship.